Like what you see? Subscribe to The Nutritionist Reviews blog for more healthy recipes. Yesterday, I wanted to use up a few ingredients that were going to go bad so I made a delicious and filling smoothie. 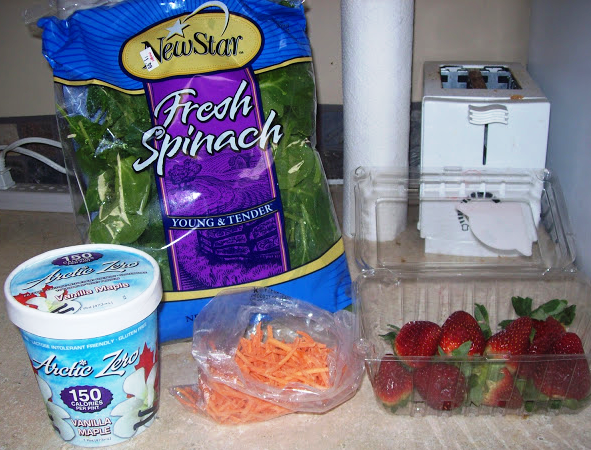 This smoothie is high in vitamins A and C from the strawberries and carrots. First, I laid out the ingredients. Missing from the picture is skim milk and Healthy Balance Juice. And blend on pulse for about a minute. I was not sure how I would like the carrot in there but you could not taste it at all. It was a great smoothie. doesn't sound too bad, but it does sound very healthy! If i make it out to my natural foods store, i may try it out! Ok the spinach part has me....I don't know if I could do it. See I wouldn't mind tasting purred carrot, just not sure about purred spinach. Can you taste the spinach?? I put carrots and spinach in smoothies all the time and I like them because you can't really taste them, but adds veggies to my diet. My sons like that the smooties are green, but I don't tell them about the spinach!